A hot and spicy chicken recipe, Peri Peri chicken is a speciality of the Nando's restaurants. This recipe uses a home made Peri Peri sauce that is made with several chile peppers, chile powder and other ingredients. You can make extra quantities of the Peri Peri sauce and keep it refrigerated until needed. The chicken has to marinade in the Peri Peri sauce for at least 2 hours (the longer the better) so you can start the marinade process a day ahead. Add the chicken, butter, Peri Peri sauce, lemon juice, garlic and paprika in a large bowl. Chop the chicken into bite sized pieces and add to the bowl with the marinade ingredients. Toss well to cover evenly, cover with plastic wrap and marinade for at least 2 hours in the refrigerator. Cook the marinaded chicken in a wok or similar frying pan over medium high heat, stirring often, until the chicken is slightly browned and cooked through. 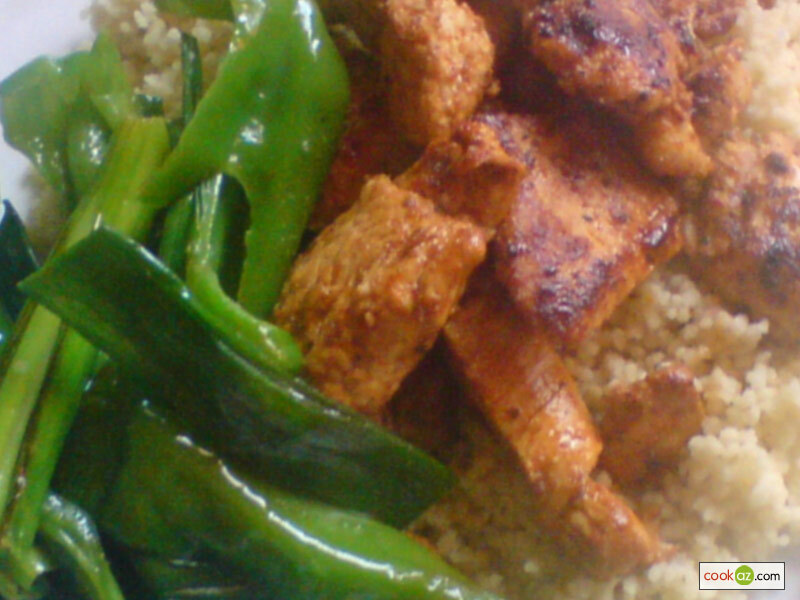 Serve with cous-cous and sauted bell peppers in olive oil. Combine all ingredients in a blender and process to a smooth paste. Taste and adjust with salt, pepper, cayenne pepper and paprika. Refrigerate for at least 24 hours to allow flavors to develop. Rehydrate the dried chiles in a bowl of hot water for 20 to 25 minutes. Cut in half, and get rid of veins and seeds. Chop roughly and process in a blender with the rest of the ingredients until smooth. Use more olive oil to adjust the thickness of the sauce. Taste and adjust with more lemon juice and salt. The quantities will yield about 2 cups of Peri Peri sauce. I love eating at Nando's. and with this recipe, it' heaven answering my prayer. can't wait to try, i'm certain it will be yummy. it is very tasty and delicious dish love it. Look at "chicken talliwang" similar from Indonesia OMG this is a die for recipe yuuuuuum! Here is the authentic peri-peri receipe which we follow from africa given to me by fellow portugese mates from angola/mozambique known in this part of the world as Mama Rahim's receipe. 2 fresh limes - squeezed and pulp included. 1 tablespoon of bird's eye chilli (alternatively, use dried thai chilli from chinese stores crushed). Mix completely until marinade is consistent. Then add the chicken pieces. Leave at least 12 hours - that is the key. Then on hot fire grill these chicken pieces; coating with the marinade at times to keep moist. Mama rahim's marinade matches Nandos if not better.... folks swear by it. Very good. Made with chicken wings then baked them.